Initially, the center of the Ryazan principality was located a few dozen kilometers below the Oka river. Now the village of Staraya Ryazan is located on the site of the ancient capital of the principality. After the destruction and burning of the city in 1208, it was Pereyaslavl– Ryazansky that became the center of Ryazan territory. In our days it constitutes modern Ryazan (since 1778). 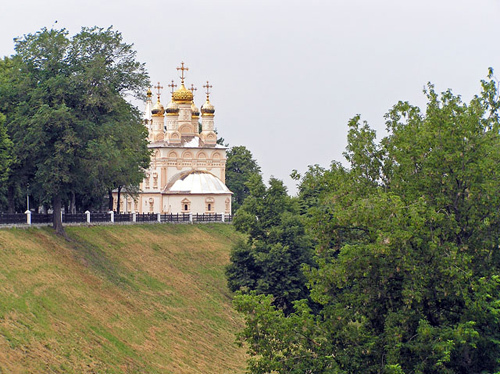 The earth walled Kremlin on the bank of the river Trubezh, The Uspensky (Assumption) Cathedral (late 17th century) and other historical monuments in Ryazan are located about 2 kilometers from the Oka.